Happy Tuesday everyone! It's time to announce the Rock Star and Rockers for Kath’s “All About Christmas” Challenge. But first, we'd like to thank everyone who played along with us. Your entries were wonderful and as a result it made our choices harder. 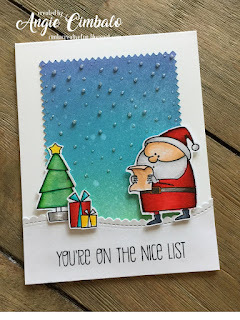 Kath's choice for our Watercooler Rock Star is Tristan's gorgeous watercolour-look clean and simple card. Can you believe she made those stamps herself? Following the winner are the Watercooler Artists choices for the Watercooler Rockers. Kath's Winner: I love the faux watercolor effect and the fact that she made her own stamp. Congratulations, Tristan! 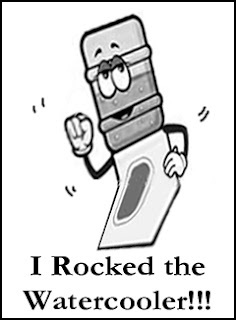 Here is your badge to proudly display on your blog designating you as our Watercooler Rock Star! 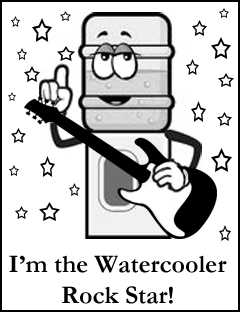 Now it's on to the Watercooler Artists choices for our Watercooler Rockers. They appear in the order of entry into the challenge. Heidi’s Choice: There are so many additional touches which add to the impact of this cute card. I especially love the colouring and those sparkly glitter drops. Penny’s Choice: Maya’s candle box is a beautifully crafted keepsake for Christmas. I really liked the colouring on the candle image and addition of pine branches and berries. 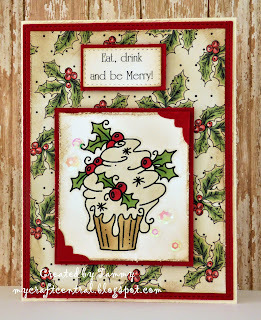 Judy’s Choice: I love the image and the whole wonderful feel of this card. 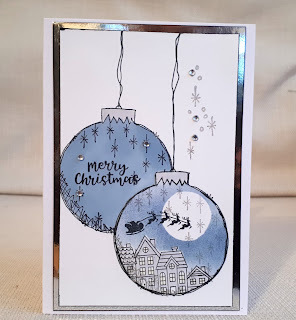 Gail’s Choice: The sketchy look of the baubles has a nostalgic feel and the blue & white colour scheme goes well with the pop of silver. Charlotte’s Choice: I love the non-traditional colours and the bokeh effect. A really lovely clean and simple design. Marsha's Choice: Isabelle’s evening star is beautiful. 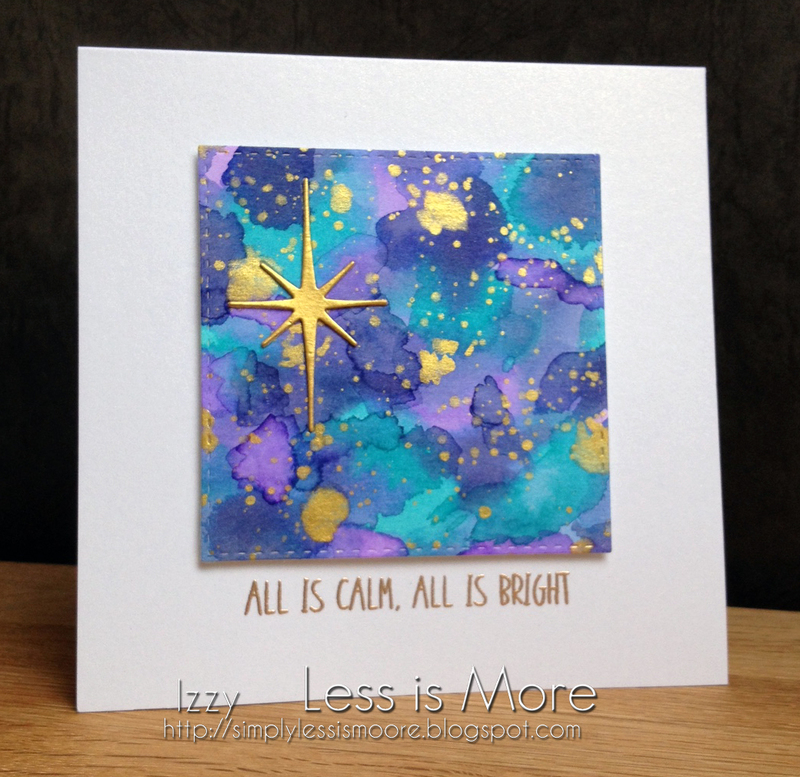 I love the combination of Brushos, Distress Inks, and gold for her “gleaming sky” background. Congratulations to Angie, Maya, Tammy, Marina, Sharon and Isabelle. 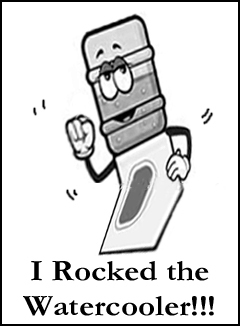 Here is your badge to proudly display on your blog designating your as our Watercooler Rockers. There you have our Rock Star and Watercooler Rockers lineup for this week! Be sure to come back tomorrow, November 29th, for our next Watercooler Wednesday Challenge. You won't want to miss out on all the wonderful designs by our Watercooler Artists. Thanks so much for the shout out! You just made my day! Congrats to all and thank you for hosting these fun challenges! Thanks, Angie. It's hard to believe that we get more and more amazing cards each week. Thanks for your participation. Thank you Gail and all the DT. Congrats to Tristan and all the picks. Thanks so much Judy for choosing my card, so happy! Congrats to the others as well! OMG, what a surprise ! Thank you so much Marsha for choosing my card ! You made my day ! And Congratulations to Tristan and all the other picks !